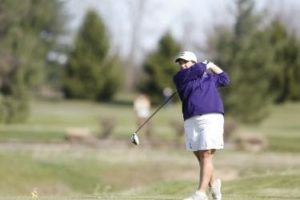 Well into the fall portion of their seasons, Capital University’s men’s and women’s golf teams are making headway and setting themselves up for spring. Led by head coach Andy Garcia, both teams have had success throughout the fall. The success of the men’s team is largely due to the efforts of senior Logan Holbrook. Holbrook has been a consistent performer throughout his time on the team and has recently broken not one, but two school records. Holbrook achieved a single-round score of 67 on Sept. 22, at Bluffton University’s Beaver Fall Classic, beating the record set Mitch Cook. After the weekend was over, Holbrook’s two-day total also broke the program record, a mark set in 2015 by Daniel Schafer. Both Cook and Schafer are former teammates of Holbrook’s. Holbrook also won the Beaver Fall Classic, notching the fourth individual victory of his career and helping the Capital men’s team to a second-place finish. The women finished in fifth at Bluffton’s tournament, also with the help of a record-breaker. Senior Sydney Kelly set Capital’s single-round record of 78 at a tournament hosted by Baldwin-Wallace University earlier in September. She edged out former teammate Aly McGinnis, who set the previous record during the 2015 season. Holbrook and Kelly are not alone in stardom, according to Coach Garcia. Garcia specifically mentions Ryan Czerniakowski and Chris Dearth as other impact players on the men’s side. Garcia mentions that Dearth, currently the number four golfer in the rotation, has a third-place finish under his belt. In respect to the women, Garcia praises seniors Sydney Kelly and Kate Kinley, the latter of whom he says has “had a monster fall” with three top-five finishes. Garcia also speaks highly of sophomores Maddie Harsh and Molly Frey, both of who are reportedly on their way to spring seasons that are even better than their already successful falls. The spring season is when play gets even more competitive, and Garcia says both of his teams are well-equipped for a shot at the Ohio Athletic Conference (OAC) title. Garcia cites Otterbein University at Baldwin-Wallace University as the stiffest competition on the men’s side, though he hesitates to settle on one team being better than the others. On the women’s side, Otterbein University and the University of Mount Union are top contenders alongside Capital. Mount Union has won the OAC over the last three years, but Garcia is confident that their reign is over. Crusader golf will be back in action throughout October, with the men’s team playing until Oct. 22 and the women finishing on Oct. 16. The golf teams will be making the most of the fall and bolstering their performances in preparation of what will undoubtedly be a successful spring.